Christian Family International was founded in 1999 in Rotterdam by our Lord Jesus Christ through His servant Bishop Nana Opoku. The church has been a great help to many lives in the nation and overseas through the spiritual oversight and responsibilty of taking care of the needy members and as many that the Lord brings to us. Many broken marriages has been restored through the prayer of the church; the blind receiving their sight; broken hearted receiving the peace of God; the abused ones regainning a blessed, peaceful and normal life again. 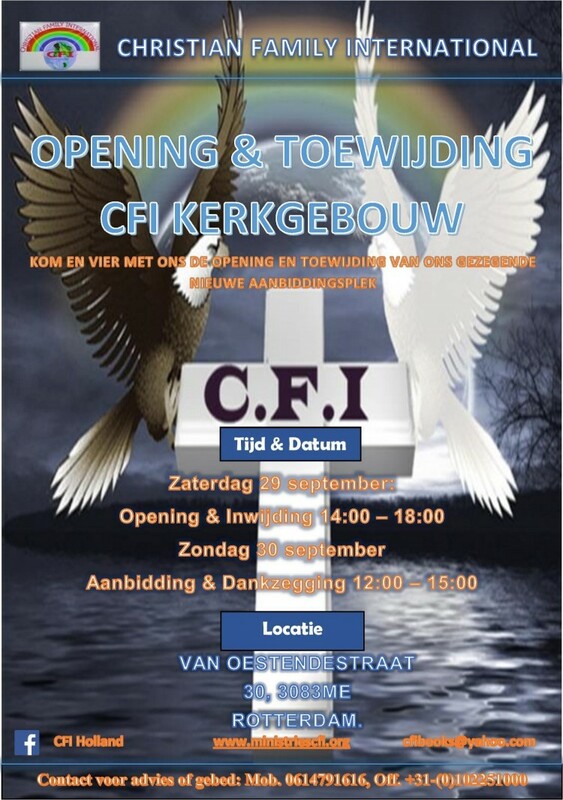 Christian Family International has also been playing a vital role in bringing the churches of Christ together in Nederland. By the direction of God given to Bishop Nana, a group of watchmen comprising of pastors and leaders from other churches was formed to intercedes for the city of Rotterdam and Nederland. Bent u opzoek naar een plek om uw kerk diensten te houden of wilt uw een christelijke evenement organiseren en heeft u daar een ruimte voor nodig? Dan bent u aan het juiste adres! Wij hebben de ruimte beschikbaar op donderdag van 18:00 tot 22:00 en zondag van 08:00 tot 11:00. Geïnteresseerd? Neem dan contact met ons op via cfibooks@yahoo.com of +31614791616.